The policing technologies market in Europe is characterized by the presence of large multinational companies concentrated on research and development activities so as to remain competitive. The rise in terrorist attacks across the region, the surge in crime rates, and severe migration crisis have compelled security forces in Europe to adopt advanced policing technologies. Police departments in some of the most developed regions of the world have been relying on policing technologies to enhance their responsiveness, control crimes, and reduce fatalities. The policing technologies market in Europe is poised to expand at a 6.0% CAGR from 2016 to 2024, with the opportunity rising from US$1.4 bn in 2015 to be worth US$2.4 bn by the end of the forecast period. The policing technologies market is segmented on the basis of type into communication technologies, less lethal technologies, aviation technology, detection and surveillance technology, and others. Among these, detection and surveillance technology emerged as the leading contributor in the policing technologies market in Europe. The rising focus on the part of the police department of various countries so as to reduce crimes is propelling the demand for detection and surveillance technologies. Aviation technology is likely to expand at the highest CAGR of 6.8% during the forecast period of 2016 to 2024. These technologies have proven to be extremely essential in time-critical situations such as searching for missing people or surveying a hostage scene. The demand for aviation technologies is anticipated to receive a boost from the rising use of drones for security purposes. The Europe policing technologies market comprises the U.K., Germany, Russia, France, Italy, and others. In 2015, the U.K. led the policing technologies market in Europe, accounting for a share of just over 26%. Expanding at a rapid pace over the coming years, the policing technologies market in the U.K. is expected to retain its lead through 2024. The market is driven by the growing application of automatic number plate recognition technology by the police force. The introduction of handheld touchscreen devices to scan the digital fingerprints of suspects is also contributing toward the demand for policing technologies in the U.K.
France is also a major market for policing technologies in Europe and is fueled by the introduction of computers or mobile devices in police cars. The market in France also benefits from the rising application of video surveillance technology and image processing software by the police force. Although the U.K. is predicted to emerge as the fastest growing regional market for policing technologies by 2024, the market in Russia is forecast to witness rapid growth as well. The increasing adoption of drones by the police to control traffic is likely to be responsible for this future growth. Some of the key players in the Europe policing technologies market are PredPol, Inc., Aventura Technologies, Inc, Reveal Media Ltd., Zepcam B.V., Basler AG, SmartWater Technology Limited, Computer Sciences Corporation, Brite-Strike Tactical Illumination Products Inc., Aeryon Labs Inc., and Taser International Inc.
Technology has been an integral part of police departments and has shaped it in many important ways. Advancements in technology have created enormous potential for enhancing police work. Often technologies have been adapted from the commercial marketplace as in the case of radios, cars, and computers among others. Crime control can be strengthened by using technology, for example, enhancing the ability of the police in identifying and monitoring offenders and also facilitate in identifying the places and conditions that can contribute disproportionately to crime. Enhancement in technology has also resulted in improving evidence collection, speeding up of the detection process, and also response to crimes. Furthermore, technological advancements pertaining to weapons, protective gear, and surveillance capabilities has reduced fatalities and deaths of officers, bystanders, and suspects drastically. The policing technologies market on the basis of type has been segmented into five segments; aviation technology, communication technology, detection and surveillance technology, less lethal technology and others. The policing technologies market in Europe is primarily driven by factors such as increase in terrorist attacks coupled with increasing crime rates. Europe has been a victim of several terrorist attacks in recent years which have positively impacted the policing technologies market in the region. There has been increasing demand to make law enforcement departments more efficient in order to counter the terrorist attacks. Moreover, there has been an increase in crime rate across various countries in Europe. Issues such as drug related crimes are on the rise and countries such as Greece have been a victim of the same. For example, Omonoia Square in Greece has been an epicenter for drug-related activities. However, lack of proper training is one of the major restraints hindering the growth of the policing technologies market. The rapid growth in technology has resulted in an overwhelming number of products, services, and requirements which further results in additional staff training. The incorporation of new technology into police work also requires the need to thoroughly test, develop policy, investigate, and train. There are varied complexities associated with the adoption and use of various new policing technologies as a result of which there is often a long time gap in the adoption of these technologies. Police agencies need extensive training to become familiar with latest technologies such as facial recognition software, DNA testing, driverless cars, and gunshot locating detection systems among others. 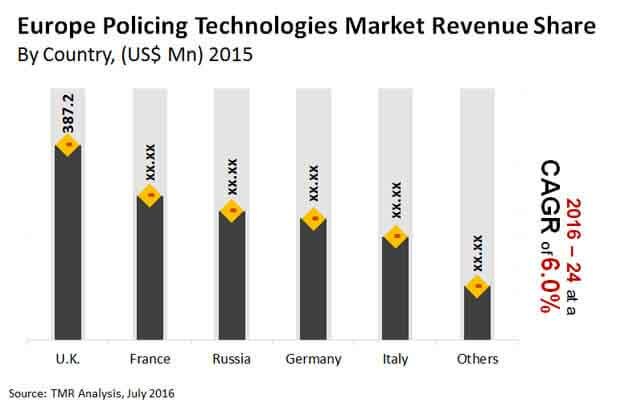 The competitive profiling of the key players in the Europe policing technologies market and their market shares across six countries which include U.K., France, Germany, Italy, Russia and others have been exhaustively covered under the purview of the study. Moreover, the distinct business strategies that have been adopted by the major players in the market have also been included in the report. For providing a detailed insight into the Europe policing technologies market, the market attractive analysis has been provided in the report. A comprehensive analysis of market dynamics, which include the market drivers, restraints and opportunities, is included under the scope of the report. Market dynamics are the distinctive factors that influence the growth of the specific market and therefore help to study the current trends in the global market. Additionally, Porter’s Five Forces analysis has also been included under the scope of the research. Thus, this report provides an inclusive study of the Europe policing technologies market and also provides the forecast of the market for the period from 2016-2024. Some of the major players in the market are: PredPol, Inc., Aventura Technologies, Inc, Reveal Media Ltd., Zepcam B.V., Basler AG, SmartWater Technology Limited, Computer Sciences Corporation, Brite-Strike Tactical Illumination Products Inc., Aeryon Labs Inc. and Taser International Inc.